You may find reds along with big trout concentrated in potholes, along the edges of bars or tailing on shallow grass flats on negative low tides this month. This is a good month for catch and release snook action around lighted docks in the ICW. Some lights will also have trout and reds making it possible to get a dock “slam”. There may also be good action in the coastal gulf with false albacore (little tunny), Spanish mackerel and tripletail, depending on conditions. However, catch and release snook fishing around lighted docks can be good this month unless it gets too cool. 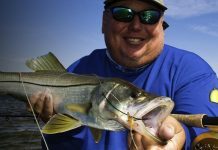 I won’t target snook following a strong cold front or if the water dips below 60 degrees, since they may be stressed at that time. However, it can be very good in December under normal conditions. Larger baitfish will thin out and snook will gorge themselves on glass minnows and small shrimp in the ICW at night. I like docks that have a good tidal flow and deep water under them. CAL jigs with shad tails and jerk worms, DOA Tiny TerrorEyz and DOA Shrimp are my favorite lures for snook at night. Fly anglers should do well with sink tip fly lines and small white flies. Fish peak tidal flows for the fastest action. You might find reds in potholes or along the edges of flats and bars on negative low tides. They may also tail on shallow grass when the tide is low. Weedless rigged CAL shad tails and jerk worms, DOA Shrimp and lightly weighted flies with weed guards will work well in that situation. As the tide rises, reds will spread out and feed on shallow flats. You may also find them around docks this month. I usually let the stage of the tide tell me where to look for reds. You may also find big trout in skinny water this month in many of the same areas where you find reds. The same lures and techniques that I use for reds will also work for trout in the same areas. I release all big trout (over 20”) since they are usually females and I feel it is important that they are left in the water as breeders. You should also find trout on deep grass flats this month along with blues, flounder or pompano. Blues may sometimes feed on the surface, so bird activity may give their presence away. 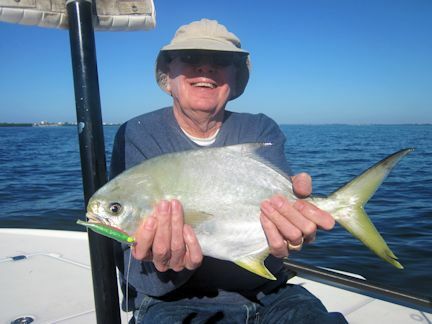 Pompano may skip when you drift or run past them and when that happens, circle back upwind and drift through the area casting ahead of your drift. Flounder prefer a mix of sand and grass, particularly in potholes or on the edges of bars. I like to drift and cast ahead of my drift with CAL jigs and a variety of plastic tails or DOA Deadly Combos. Fly anglers should score with sink tip fly lines and weighted flies, like Clousers or my Grassett Deep Flats Bunny fly, which behaves like a jig with a shad tail. 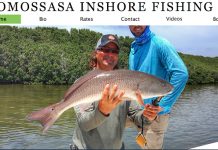 I like the shallow flats of the south shore of Tampa Bay and Gasparilla Sound for reds and trout and deep grass flats that are close to passes, on points and along sand bars for trout, blues, flounder and pompano in December. There should still be good action in the coastal gulf with Spanish mackerel, blues, false albacore and tripletail. Rough or cold water later in the month may slow the action and move fish south or offshore. Look for terns either diving or hovering low over the surface of the water to find albies, blues and mackerel feeding on the surface. Once you’ve found them, cast top water plugs or CAL jigs with shad tails to catch them. Fly anglers should score with glass minnow fly patterns, poppers or Crease flies. Sometimes top water plugs or fly poppers will draw fish to the surface, especially over structure. You’ll need to add wire or heavy fluorocarbon to your leader when blues and mackerel are around. Look for tripletail around crab trap floats or channel markers. Once you’ve located a fish, work back into the wind or current with an electric trolling motor to get into casting range and cast a DOA shrimp, a weedless-rigged CAL shad tail or lightly weighted fly with a weed guard to them. Try to make your first shot count since they are much tougher to catch once they know you’re there. There will be lots of options in December, although weather becomes more of a factor. When fishing flats, I usually let conditions and the stage of the tide determine when, where and what I will target. I like to fish the coastal gulf for false albacore and tripletail whenever conditions are good. Our natural resources are under constant pressure from red tides fueled by agricultural and residential runoff, freezes, increasing fishing pressure and habitat loss and degradation, please limit your kill, don’t kill your limit!